Who should offer pujas at Thirunallar Temple? Saturn comes into the life of each and every person some time or other, depending on the horoscope at the time of his birth. So everyone should worship Him. Those who are having the Shani MahaDasa or Shani Bhukti running. Shani Mahadasa is a period of 19 years. Those who were born in the 'Poosham, Anusham and Uttirattati Nakshatras, will have their first Dasa as 'Sani'. Those that are having Shani in the 4th, 7th, 10th (Kandaka) and 8th houses (Ashtama) from Raasi. The above basically illustrates that all of us are under the influence of Saneeswara some time or other to varying degrees and worshipping him benefits the devotee. 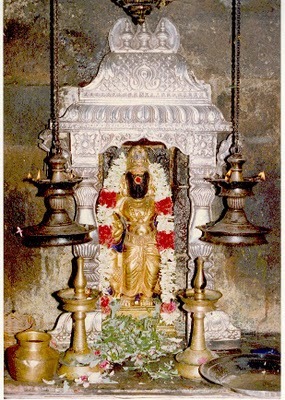 Worshiping Lord Shani at Thirunallar temple can reduce ill effects and increase the good effects. For over thousand years Hindus have visited this temple and have found their misfortunes and bad luck to decrease as this is the only temple in the world where Lord Shani lost his power to Lord Shiva. Devotion to Lord Shani helps people to develop a positive mindset even during the harshest of Shani transit periods. While it is true that offering worship here decreases the difficult effects and increases the positive effects of Saturn it does not completely eliminate the hardships we will face due to Shani Bhagawan. The true benefit of offering prayers is to get a positive mental attitude that helps us understand the deeper lessons that Shani Bhagawan wants us to learn. Saturn is known as the Celestial Taskmaster and the Grand Teacher. During the most difficult times, we need to pray to Shani Bhagawan so he can help us learn the lessons he wants to teach. Worship will help us learn to benefit even from the biggest misfortunes that befall us. Worship of Lord Shani will help us benefit from great difficulties, challenges and limitations. It is through these hardships we will learn valuable lessons like discipline, responsibility, endurance, and the strength to pursue our dreams and ambitions. Saturn’s lessons require you to persevere through trials and to build toward mastery step by step. It is not always possible to travel to the temple to offer pujas, don’t worry we are here for you. We are personally present at the Thirunallar Temple to offer the puja on your behalf. 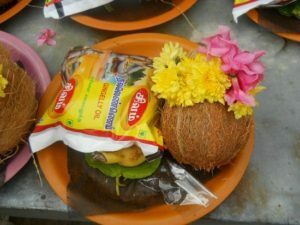 In addition to the archanai performed by us, we will pay the required fees for either the Sahasranama archanai or the Ashtothra archanai at the office of the temple. You will receive the prasadam directly from the temple. Thirunallar Temple also known as Darbaranyeswara Temple is the most famous temple dedicated to Lord Saneeswaran. At some point or the other, every human being undergoes sufferings, hardships and setbacks caused by Planet Saturn in our Horoscope. By offering pujas at Thirunallar temple we can hope to get some respite. Legend has it that under the malefic influence of Saturn, King Nala undergoes untold hardships. He loses his Kingdom, is separated from his wife, is transformed into an ugly dwarf and lives a life of penury. King Nala then offers prayers to Lord Saneeswara at Thirunallar Temple and takes a bath in Nala theertham (the temple pond). Finally, Lord Saneeswara is appeased and King Nala regains his kingdom, wife, and happiness. Since that time millions of devotees from every nook and corner of our country visit this temple to get relief from hardships inflicted by Lord Saturn. 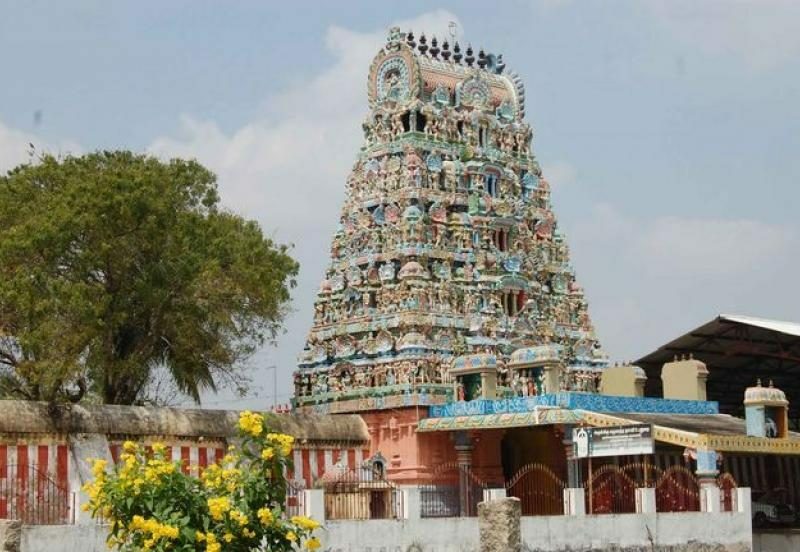 Thirunallar the holy place of Lord Sani is located 5 km's from Karaikal under the jurisdiction of Pondicherry Union Territory. On reaching the temple that is ideally situated between Arasalaru and Vanchai Rivers people can witness crowds of devotees from across the country and even different countries of the world. The road leading to the main gopuram is paved with shops and lodges on either side. The raja gopuram has 7 tiers, the second raja gopuram has 5 tiers and the third gopuram has three tiers, these gopurams are covered with beautiful sculptures. The entrance of the temple is guarded by two Dwara Balakars who have four hands each. At the end of the east street of the temple, the statue of Saint Thirugnanasambandar’s is housed in a beautiful mandapam. There are three holy corridors around the temple. These holy corridors are called Deva Praharams. There are a number of shrines for Gods and Goddess situated on these deva praharams. 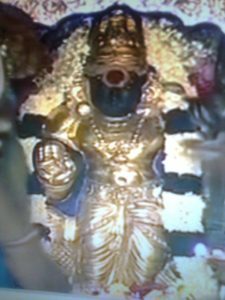 I bow to Lord Shani, who is black in colour and son of Sun and born to Chaya and brother of Yama, who moves very slowly. With this move of Saturn, the Vrischika Rasi (Scorpio moon) natives have entered their final phase of sade-sati/ezhare shani. The sade-sati for Dhanus Rasi (Sagittarius moon) natives has entered the janma shani (most difficult) phase and it will be a difficult 3 years ahead for them. 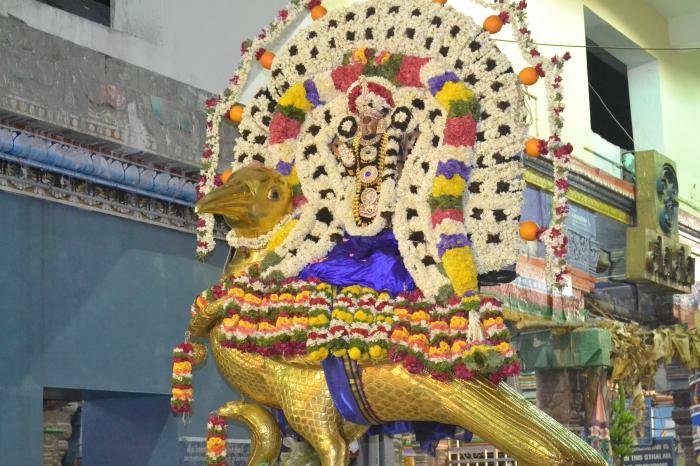 Have you visited the temple or prayed to Lord Saneeswaran? What was your experience? Please share your story and photographs with and we will put it up on the website so thousands of devotees can benefit. Since 2011 many devotees have requested our assistance to conduct Shani Shanti/Navagraha Shanti homas at Thirunallar Temple. 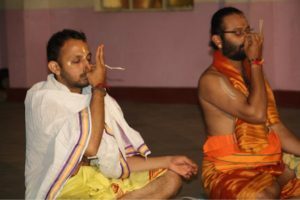 However, it is very challenging to arrange for the homa directly at the temple. 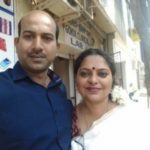 As we continue to receive these requests and we understand the importance of offering these Homas we have identified a well-renowned priest, Satish Sastrigal, in Bangalore. 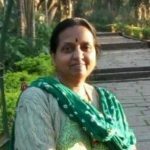 Apart from being an expert in Hindu Sashtras and Sampradaya, he is also an expert in vedic astrology. This combination makes him best suited to offer Homas on behalf of devotees looking for ways to appease Shani and any other Graha.